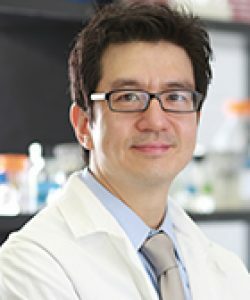 The laboratory of Dr. Koo focuses on understanding the relationship between biofilms and oral infectious diseases and seeking novel therapeutic strategies to control pathogenic biofilms, including those associated with dental caries. Biofilms are structured communities of microbial cells that are attached to a surface and enmeshed in a self-produced three-dimensional (3D) matrix of extracellular polymeric substances (EPS). The matrix provides an essential scaffold for the initial assembly and further development of biofilms. It promotes microbial adhesion, cohesion and protection as well as hindering diffusion. Importantly, the matrix also creates spatial and microenvironmental heterogeneities in biofilms, modulating the growth and survival of pathogens locally. The matrix is considered a key factor for the existence of the biofilm lifestyle and full expression of virulence by several bacterial pathogens. (1) How the extracellular matrix assembles dynamically in 3D. In particular, we are interested in understanding the structural organization of EPS, and how they modulate cell adhesion-cohesion, the 3D matrix-scaffold and mechanical stability of biofilms over time. (2) How the matrix modulates the microenvironmental heterogeneity within biofilms. Here, we focus on spatio-temporal characterization of local pH and oxygen levels, microbial organization/positioning and gene expression in situ, and how these properties influence the virulence of biofilms as a whole. (3) How to disrupt the EPS production and target the pathogens embedded in the matrix. We are interested in finding new strategies to prevent biofilm initiation or disrupt existing biofilms using naturally occurring molecules, as well as using in silico methods. We are also employing novel (nano/bio)technologies to create anti-biofilm materials and target the biofilm microenvironments. To accomplish these goals, our lab uses a combination of molecular, biochemical, imaging and biophysical techniques, which include enzymatic, confocal fluorescence microscopy, AFM/rheometry, transcriptomic-proteomic and bioengineering approaches. Several in vitro and in vivo models to study the assembly of mixed-species biofilms are available in our laboratory. We also use these biofilm models to evaluate the effectiveness of novel anti-biofilm approaches.